Pickled or roasted, steamed or boiled, I adore beets whichever way they’re prepared! I even like to grate them raw into salads for some fantastic color and flavor. Beets have always been one of my favorite vegetables and now we find them everywhere. At that trendy juice bar next to the wheat grass. Or the swanky hipster restaurant in a new cocktail. And even in that chocolate cake you are making for your kids so they will eat their veggies – but shhhh! That’s our secret! 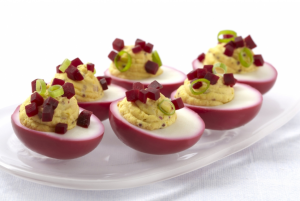 They’re great in my Beet’ing Heart Deviled Eggs! In addition to being delicious, beets are REALLY good for you! The nutrient in beet’s red pigment called betalain is high in antioxidants, has anti-inflammatory benefits, and can even reduce your risk of heart disease. Beets are also a great source of fiber and vitamin C! If you boil or roast your beets, don’t bother peeling them before-hand. Once they’re cooked, the skins will rub right off! Looking for a new side dish? Try my Mashed Roasted Beets with Lime, Sour Cream and Cilantro. This will turn the most resistant beet eater into a beet enthusiast in no time. The sweet flavors of the beets combined with the zing of the lime and a dollop of low-fat sour cream will make this a family favorite. This beet preparation will turn the most resistant beet eater into a beet lover. If you have time, the ultimate taste intensity can be produced by roasting the beets in a 375-degree F. oven until very tender; allow about 1 – to 2 hours depending upon the size of your beets The yield will be reduced because of moisture evaporation, so use 5 beets. Wash the beets, trimming top to 1″ – 2″ and leaving root untrimmed. Steam until very tender (or see roasting note, above). As soon as beets are cool enough to handle, slip the skins off and cut into large chunks. Place in food processor with butter and sour cream; process until smooth-like in texture but not a total puree. Mix in lime juice, coriander, pepper flakes and chopped cilantro. Season to taste with salt.